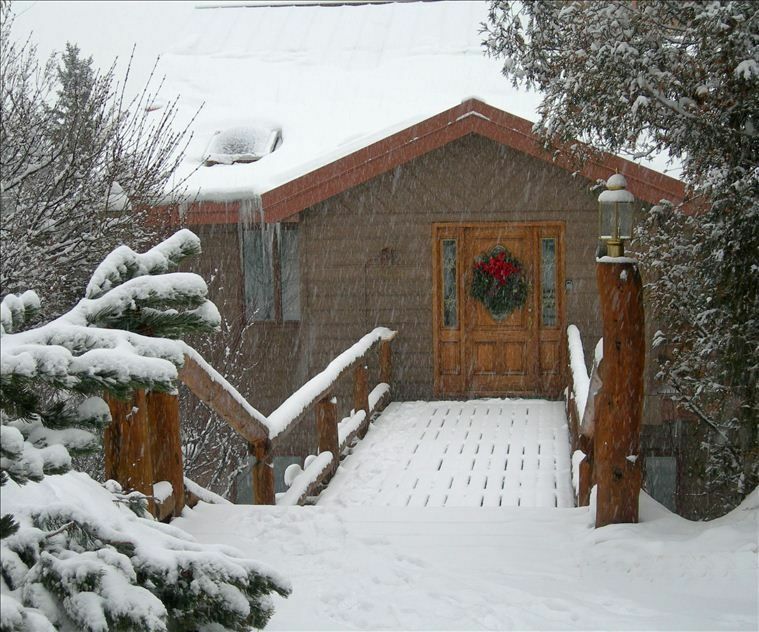 The ASPEN RIVERHOUSE is situated in the heart of the Roaring Fork valley and convenient to Aspen and Snowmass. This affordable, comfortable family-oriented home on two private, sunny, riverfront acres, features mountain vistas and direct riverfront access. Abundant lawn with path to the river which babbles year-round! Only ten minutes to Snowmass, Buttermilk, Highlands and Aspen Ski Resorts and 3 miles to Aspen Airport (served by major airlines). You are also just a short drive to White River National Forest for mountain hiking, mountain biking, horseback riding, and four wheeling trails. You can fish all year long just out your back door on the Roaring Fork River, a 'Gold Medal' trout stream. Enjoy river rafting from your backyard or just lounging by the river. An eight person hot-tub on the sundeck overlooks the river and also affords mountain and river views. A separate secluded riverside screened porch with hammock and porch swing doubles as a restful meditation area. The home also features a large natural stone fireplace with sunken conversation area, dining room seating for up to ten, skylights that brighten the full kitchen which includes utensils and all appliances, vaulted ceilings throughout, gas fireplace in master bedroom. Linen and towels are provided. Lower level includes recreation room with billiards table, home theater w/Apple TV and wet bar/fridge adjacent to 2BR, 2Baths. Experienced offsite caretakers provide snow shoveling, emergency maintenance, hot-tub care, etc. Riverhouse has a lovely landscaped yard, a paved roadway and private onsite parking. It is located one block downhill from the shuttle route serving Aspen and all ski areas. Quiet and tranquil yet just minutes from the shopping, restaurants, and night scene of incomparable Aspen. Riverhouse exceeds our needs by allowing room for everyone to have their own space with ample outdoor spaces for children/grandchildren to play in safety. Easy access to world-class fishing on site and other summer watersports. We especially enjoy being in a more relaxed setting while having easy access to all the wonters of the Roaring Fork Valley with skiing, hiking, cycling, etc. only minutes away. Situated in the Roaring Fork valley with panoramic mountain views including Red Rock Mesas and Aspen Mountain in the distance. Direct Roaring Fork River waterfront with riverside screened porch with hammock and fire ring. Step into the river to wade up or downstream for trophy trout. Perched over the Roaring Fork River a Gold Medal Trout river. Expansive views of Roaring Fork valley including Aspen Mountain. Picturesque Roaring Fork River and surrounding mountains. Direct waterfront on picturesque Roaring Fork River with gold medal trout fishing. Hydronic radiant heating with radiant floor heating in lower level (great for curling up for a movie in front of the home theater). One each on the main and lower levels. Massive stone wood-burning fireplace in cozy sunken conversation area off living area. Abundant parking on the main/street level and large lower level circular drive area. Including beach towels for the outdoor hot tub. Views of Aspen Mountain and surrounding Roaring Fork Valley. Adjacent to sunken conversation area, dining and kitchen. Gathering place open to living/dining and overlooking conversation pit and fireplace. Mountain views. Round table with leaves seats 4-10, bar seats 4. Two flat-screen TV. 42' in living area also viewable from kitchen. 60' home theater with Apple TV in lower rec room area. Receiver with iPod/iPhone jacks and wireless Bluetooth in living area, Surround Sound receiver in lower rec room area. Small collection of local interest books and guides. Lounge area on lower level with home theater, pool table, game table and wet bar. Many board games, puzzles, cards, etc. Full size Brunswick professional pool table. Room for kids to play and sled in winter. Large wood deck overlooking river with outdoor seating grouping, swing and dining furniture. Four world-class ski resorts just minutes away. Receiver type ski/snowboard rack available for your car. Private large outdoor hot tub overlooking Roaring Fork River maintained year-round. Especially fun when snowing after a hard day on the slopes. World-class Skiing, Restaurants, internationally acclaimed Aspen Wine & Food Festival, Summer Music Festival, Jazz Aspen/Snowmass, Winter X-Games.